Lenovo ThinkAgile HX Certified Nodes are designed for deploying industry-leading hyperconvergence software from Nutanix on Lenovo enterprise platforms that feature the Intel Xeon Processor Scalable Family. The ThinkAgile HX Certified Nodes deliver fully validated and integrated Lenovo hardware and firmware, certified and preloaded with Nutanix software. Nutanix brings the benefits of web-scale technologies to enterprise applications through enterprise storage, data protection, infrastructure resilience, management and analytics, and security. This product guide provides essential technical and pre-sales information on the Lenovo ThinkAgile HX7821 Certified Node, its key features and specifications, components and options, and configuration guidelines. This guide is intended for technical specialists, sales specialists, sales engineers, IT architects, and other IT professionals who want to learn more about the ThinkAgile HX7821 Certified Node and consider its use in IT solutions. The ThinkAgile HX7821 is a 4U rack-mount certified node that supports four processors, up to 6 TB of 2666 MHz TruDDR4 memory, 16x SAS/SATA and 8x AnyBay SFF hot-swap drive bays with an extensive choice of SAS/SATA SSDs and SAS HDDs, and flexible network connectivity options with 1/10 GbE RJ-45, 10 GbE SFP+, and 10/25 GbE SFP28 ports. Several common uses for the ThinkAgile HX7821 Certified Node that is optimized for high-performance workloads include databases, e-mail and collaboration, and workload-balancing clusters. The ThinkAgile HX7821 Certified Node is shown in the following figure. The ThinkAgile HX Certified Nodes are built on industry-leading Lenovo ThinkSystem servers that feature enterprise-class reliability, management, and security. The ThinkAgile HX Certified Nodes offer ThinkAgile Advantage Single Point of Support for quick 24/7 problem reporting and resolution. The ThinkAgile HX Certified Nodes are designed for the industry’s most feature-rich hyperconverged infrastructure from Nutanix. Nutanix brings the benefits of web-scale technologies to enterprise applications through enterprise storage, data protection, infrastructure resilience, management and analytics, and security. Built on proven and reliable Lenovo ThinkSystem servers featuring Intel Xeon Processor Scalable Family that provide compute power for a variety of workloads and applications. Deliver fully validated and integrated hardware and firmware that is certified with Nutanix software. Preloaded with Nutanix software and ready for out-of-box deployment (software licenses are not included). Provide flexibility in using the existing Nutanix term-based software licenses and active support contracts or purchasing new software licenses and support contracts from Nutanix. Include Lenovo ThinkAgile Advantage Single Point of Support for quick 24/7 problem reporting and resolution. Offer optional Lenovo Professional Services to get customers up and running quickly. A natively integrated solution for data protection and continuous availability at VM granularity that gives administrators an affordable range of options to meet the recovery point objectives (RPO) and recovery time objectives (RTO) for different applications. A fault resistant platform, with no single point of failure and no bottlenecks with shared-nothing architecture, where all data, metadata and services are distributed to all nodes within the cluster, that is built to detect, isolate and recover from failures anywhere in the system. An intuitive user-centric management experience to simplify every aspect of the IT infrastructure lifecycle and provide a single pane of glass to monitor and control Nutanix clusters, with simplified workflows and rich automation for common administrative tasks. Powerful security features, such as two-factor authentication and data-at-rest encryption, with a security development lifecycle that is integrated into product development to help customers meet the most stringent security requirements. The following figure shows the front view of the HX7821 Certified Node. The following figure shows the rear view of the HX7821 Certified Node. The following table lists the system specifications of the ThinkAgile HX7821 Certified Node. Processor Four Intel Xeon Gold or Platinum processors. Memory Up to 48 DIMMs. Support for 32 GB TruDDR4 2666 MHz RDIMMs, 64 GB TruDDR4 2666 MHz LRDIMMs, or 64 GB and 128 GB TruDDR4 2666 MHz 3DS RDIMMs. Memory capacity Up to 6 TB with 48x 128 GB 3DS RDIMMs. Memory protection Error correction code (ECC), Single Device Data Correction (SDDC; for x4-based memory DIMMs), Adaptive Double Device Data Correction (ADDDC; for x4-based memory DIMMs), patrol scrubbing, and demand scrubbing. Drive bays 16x SAS/SATA and 8x AnyBay SFF hot-swap. 2 cache drives: From 4 to 10 capacity drives in increments of 2 drives. 4 cache drives and 8 or from 12 to 20 capacity drives in increments of 2 drives. 6 cache drives and from 12 to 18 capacity drives in increments of 2 drives. 8 cache drives and 16 capacity drives. All Flash: From 6 to 24 SSDs in increments of 2 drives. Note: All SSDs in the certified node must be of the same model and capacity. All HDDs in the certified node must be of the same type and capacity. Hybrid: Up to 48 TB (20x 2.4 TB HDDs). All Flash: Up to 92 TB (24x 3.84 TB SSDs). Storage controller 2x 430-16i HBAs (12 Gbps SAS/6 Gbps SATA). 2x or 4x base 1/10 GbE RJ-45 or 10 GbE SFP+ network ports. 2x or 4x optional 10 GbE SFP+, or 2x optional 25 GbE SFP28 expansion network ports. Boot drive 2x 128 GB M.2 non-hot-swap SSDs (RAID-1). Slot 1: PCIe 3.0 x8; full-height, half-length (not used). Slot 2: PCIe 3.0 x8; full-height, half-length (for a network adapter). Slot 3: PCIe 3.0 x8; full-height, half-length (not used). Slot 4: PCIe 3.0 x8; full-height, half-length (for a network adapter). Slot 5: PCIe 3.0 x16; low profile (for a network adapter). Slot 6: PCIe 3.0 x16; low profile (for a network adapter). Slot 7: PCIe 3.0 x8; low profile (for a network adapter). Slot 8: ML2 x16; low profile (not used). Slot 9: LOM Card slot (PCIe 3.0 x8 interface). Slot 10: PCIe 3.0 x8; full-height, half-length (not used). Slot 11: PCIe 3.0 x8; full-height, half-length (for a network adapter). Slot 12: PCIe 3.0 x8; full-height, half-length (for a network adapter). Slot 13: PCIe 3.0 x8; full-height, half-length (for a network adapter). Compute tray: Internal PCIe 3.0 x8 (for an internal storage controller). Storage tray: Internal PCIe 3.0 x8 (for an internal storage controller). Cooling Six hot-swap fans with N+1 redundancy in the compute tray. Power supply Four redundant hot-swap 1600 W (200 - 240 V) High Efficiency power supplies (80 PLUS Platinum certified). Video Matrox G200 with 16 MB memory integrated into the XClarity Controller. Maximum resolution is 1920x1200 at 60 Hz with 32 bits per pixel. Hot-swap parts SSDs and HDDs, power supplies, and fans. Systems management XClarity Controller (XCC) Enterprise (Pilot 4 chip), proactive platform alerts, light path diagnostics, XClarity Provisioning Manager, XClarity Administrator and XClarity Pro, XClarity Energy Manager (optional). Security features Power-on password, administrator's password, secure firmware updates, Trusted Platform Module (TPM) 1.2 or 2.0 (configurable UEFI setting). Software Nutanix Acropolis Pro and Ultimate editions (licenses purchased separately from Nutanix). Nutanix Acropolis Hypervisor (Bundled with AOS). VMware ESXi 6.5 Update 1. VMware ESXi 6.5 Update 2. VMware ESXi 6.7 Update 1. Hardware warranty Three-, four-, or five-year customer-replaceable unit and onsite limited warranty with ThinkAgile Advantage Support and selectable service levels: 9x5 next business day (NBD) parts delivered or onsite response, 24x7x4 or 24x7x2 onsite response, or 6-hour or 24-hour committed repair (select countries). Also available are 1-year and 2-year post-warranty extensions, YourDrive YourData, Premier Support, and Enterprise Server Software Support. Note: You are required to engage a Lenovo representative in the project that includes the ThinkAgile HX Certified Nodes. The following table lists the base CTO model of the ThinkAgile HX7821 Certified Node. The following table lists the base chassis for the HX7821 Certified Node. The ThinkAgile HX7821 Certified Node ships with four processors. The following table lists the processor options that are available for selection. The following table lists the specifications of the processors for the certified nodes. The ThinkAgile HX7821 Certified Nodes support Lenovo TruDDR4 memory. TruDDR4 memory uses the highest-quality components sourced from Tier 1 DRAM suppliers and only memory that meets strict requirements is selected. It is compatibility tested and tuned to maximize performance and reliability. The ThinkAgile HX7821 Certified Nodes support 24 or 48 DIMMs. Each processor has six memory channels, and there are two DIMMs per channel. The certified node supports RDIMMs, LRDIMMs, or 3DS RDIMMs. All DIMMs in the certified node must be of the same type (RDIMMs, LRDIMMs, or 3DS RDIMMs). All DIMMs in the certified node operate at the same speed up to 2666 MHz, which is determined by the maximum memory speed supported by the specific processor. Note: Maximum memory speed can be achieved when Max performance mode is enabled in UEFI. 3DS RDIMMs: 6 TB (requires processors that support 1.5 TB of memory per socket). Single Device Data Correction (SDDC) works only in the independent channel mode (the default operational mode) and supports only x4-based memory DIMMs. Adaptive Double Device Data Correction (ADDDC) works with x4-based memory DIMMs and requires two DIMM ranks per channel, Intel Xeon Gold or Platinum processors, and the Closed Page memory access mode. The following table lists memory selection options available for the HX7821 Certified Node. The ThinkAgile HX7821 Certified Node provides 16x SAS/SATA and 8x AnyBay SFF hot-swap drive bays for configurable storage capacity, and it contains two internal M.2 SATA non-hot-swap SSDs configured in a RAID-1 drive group for software preload. The following table lists the internal storage options for the HX7821 Certified Node. 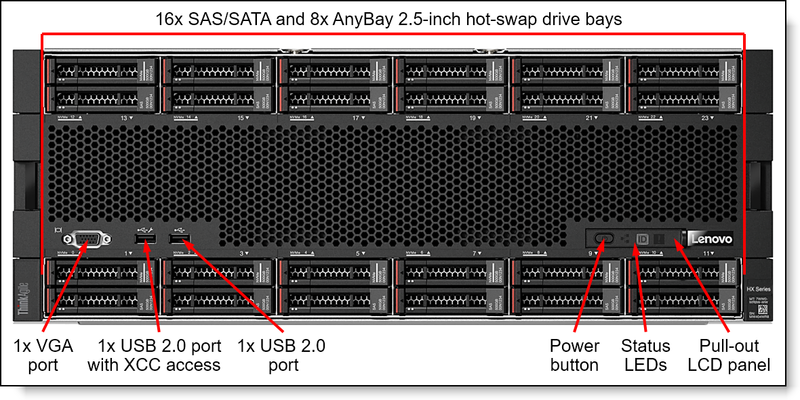 Two SAS/SATA backplanes, four AnyBay (SAS/SATA/NVMe) backplanes, and one M.2 with Mirroring Enablement Kit are derived by the configurator. The M.2 with Mirroring Enablement Kit is connected to the Intel PCH via the PCIe link, and the kit supports two 128 GB M.2 SATA SSDs configured in a RAID-1 drive group for software preload. The following table lists M.2 drives for software preload. The following table lists the storage controllers for internal storage of the HX7821 Certified Node. Configuration note: Two low profile SAS HBAs for internal storage are derived by the configurator, and they occupy the dedicated PCIe x8 slots on the compute and storage trays. The following tables list the drive selection options. 4 cache drives: 8 or from 12 to 20 capacity drives in increments of 2 drives. 6 cache drives: From 12 to 18 capacity drives in increments of 2 drives. 8 cache drives: 16 capacity drives. For All Flash configurations, the HX7821 Certified Node supports from 6 to 24 SSDs in increments of 2 drives. All SSDs in the certified node must be of the same model and capacity. All HDDs in the certified node must be of the same type and capacity. The ThinkAgile HX7821 Certified Nodes provide base two- or four-port 1/10 GbE RJ-45 or 10 GbE SFP+ network connectivity with the onboard Intel X722 NIC and a LOM card installed in the certified node. Two or four additional 10 GbE SFP+, or two additional 10/25 GbE SFP28 expansion ports can be selected, if required. The following table lists the network adapter options that are available for selection. One of the 1/10 GbE RJ-45 or 10 GbE SFP+ LOM cards is required for selection, and it provides base network connectivity. Optional expansion ports can be selected, if needed. 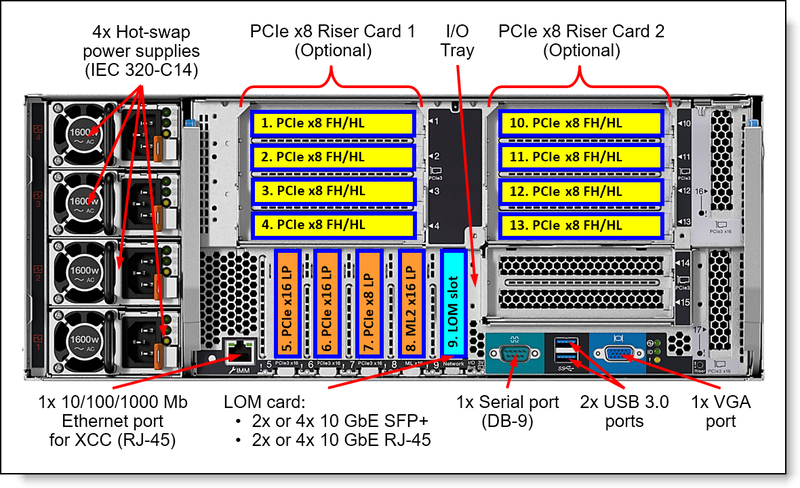 Without riser cards: Up to three PCIe network adapters in the PCIe slots 5, 6, and 7. One or two 10 GbE network adapters: PCIe slots 5, 13, 6, 11, 12, 7. One 25 GbE network adapter: PCIe slots 5, 6, 12, 13, 11, 7. One or two 10 GbE network adapters: 5, 13, 4, 6, 11, 2. One 25 GbE network adapter: PCIe slots 5, 6, 12, 13, 4, 11. Supported transceivers or DAC cables should be purchased for the SFP+ and SFP28 adapters, and UTP Category 6 cables should be purchased for the 10 GbE RJ-45 adapters. The maximum number of transceivers or cables that are supported per adapter equals the quantity of the adapter ports, and all adapter ports must have the same type of the transceiver or cable selected. The following table lists cables for the 10 GbE RJ-45 adapters. The following table lists transceivers and cables for the 10 GbE SFP+ adapters. The following table lists transceivers and cables for the 25 GbE SFP28 adapters. The ThinkAgile HX7821 Certified Nodes ship with four 1600 W (230V) High Efficiency hot-swap power supplies listed in the following table. The ThinkAgile HX7821 Certified Nodes ship with four customer-configured power cords. The following table lists the rack power cables and country-specific line cords that can be ordered for the HX7821 Certified Nodes. The HX7821 Certified Nodes ship with the rail kit shown in the following table. The following table summarizes the rail kit features and specifications. * While certain servicing tasks require the certified node to be removed from the rack cabinet, the majority of certified node components can be serviced from the front or rear of the certified node, which does not require the removal of the certified node from the rack cabinet. ** If a 0U PDU is used, the rack cabinet must be at least 1100 mm (43.31 in.) deep. ^ Measured when mounted on the rack, from the front surface of the front mounting flange to the rear most point of the rail. The following table lists the hypervisors available for factory preload selection. The ThinkAgile HX Certified Nodes are shipped with the Nutanix software preloaded. Nutanix software licenses and software support are not included. Customers can use the existing Nutanix term-based software licenses and active support contracts, or they can purchase term-based software licenses and support contracts from Nutanix. The HX Certified Nodes support the Nutanix Software Pro and Ultimate editions; the Starter edition is not supported. The HX7821 Certified Nodes can be deployed as a cluster of 3 or more nodes (AOS 5.1.3 or later). The ThinkAgile HX Certified Nodes contain Lenovo XClarity Controller (XCC) Enterprise, which provides advanced service-processor control, monitoring, and alerting functions. Virtual Operator Panel provides quick access to system status, firmware, network, health, and alerts information. With proper authentication, it also allows to configure systems management and network settings and to control system power (Power on, Power off, Restart). The Virtual Operator Panel can be accessed from the XClarity Mobile App running on the Android or iOS mobile device that is connected to the front USB port with XClarity Controller access (See Components and connectors). The HX7821 Certified Nodes include basic light path diagnostics, which provides the system LEDs on the front of the certified node (see Components and connectors) and the LEDs near the monitored components (for example, the DIMM error LEDs on the system board). Also, the HX7821 Certified Nodes offer an LCD display panel, which provides quick access to system status, firmware, network, and health information. Lenovo XClarity Administrator is a centralized systems management solution that helps administrators deliver infrastructure faster. This solution integrates easily with Lenovo x86 servers, HX Series appliances, HX Certified Nodes, RackSwitch switches, and DS Series storage, providing automated agent-less discovery, monitoring, firmware updates, and configuration management across multiple systems. Lenovo XClarity Administrator is an optional software component for the ThinkAgile HX Certified Nodes which can be used to manage firmware upgrades outside of the Nutanix Prism software. Lenovo XClarity Administrator can be downloaded and used at no charge to discover and monitor HX Certified Nodes and manage firmware upgrades for them. Optional Lenovo XClarity Pro subscription license that can be selected in the configurator provides software support for XClarity Administrator for the duration of the selected warranty period. If Lenovo XClarity software support is required, the XClarity Pro option must be selected. Lenovo XClarity Energy Manager provides a stand-alone, web-based agent-less power management console that provides real time data and enables you to observe, plan and manage power and cooling for Lenovo servers, appliances, and certified nodes. Using built-in intelligence, it identifies server power consumption trends and ideal power settings and performs cooling analysis so that you can define and optimize power-saving policies. Lenovo XClarity Energy Manager license is included in the XClarity Controller Enterprise upgrade. The ThinkAgile HX Certified Nodes comply with ASHRAE class A2 specifications. The node performance might be impacted when the operating temperature is outside the ASHRAE A2 specifications. Depending on the hardware configuration, some HX7821 Certified Nodes comply with ASHRAE class A3 and class A4 specifications. To comply with ASHRAE class A3 and class A4 specifications, the HX7821 Certified Nodes must meet the hardware configuration requirement that processors with TDP more than or equal to 150 W are not installed. The following table lists the maximum system power load, rated inlet current, and system heat output based on the power supply and source voltage. The ThinkAgile HX Certified Nodes can be configured with a three-, four, or five-year hardware warranty with 24x7 ThinkAgile Advantage Single Point of Support (Lenovo server hardware and Nutanix software; requires an active software support contract from Nutanix) and various levels of coverage with a well-defined scope of services, including service hours, response time, term of service, and service agreement terms and conditions. The Lenovo local support centers perform problem determination and resolution for hardware-related issues and escalate to Nutanix, on behalf of the customer, for software-related problem determination. Nutanix will contact the customer and will own the software-related problem resolution until closure. Some countries might have different warranty terms and conditions than the standard warranty. This is due to local business practices or laws in the specific country. Local service teams can assist in explaining country-specific terms when needed. Examples of country-specific warranty terms are second or longer business day parts delivery or parts-only base warranty. If warranty terms and conditions include onsite labor for repair or replacement of parts, Lenovo will dispatch a service technician to the customer site to perform the replacement. Onsite labor under base warranty is limited to labor for replacement of parts that have been determined to be field-replaceable units (FRUs). Parts that are determined to be customer-replaceable units (CRUs) do not include onsite labor under base warranty. If warranty terms include parts-only base warranty, Lenovo is responsible for delivering only replacement parts that are under base warranty (including FRUs) that will be sent to a requested location for self-service. Parts-only service does not include a service technician being dispatched onsite. Parts must be changed at customer’s own cost and labor and defective parts must be returned following the instructions supplied with the spares parts. Also available are Lenovo Services warranty upgrades and post-warranty maintenance agreements, with a well-defined scope of services, including service hours, response time, term of service, and service agreement terms and conditions. Premier Support service offers direct access to Lenovo’s most advanced technicians for faster troubleshooting with single point of contact for end-to-end problem resolution and collaborative third-party software support. Lenovo’s YourDrive YourData service (where applicable) is a multi-drive retention offering that ensures your data is always under your control, regardless of the number of drives that are installed in your Lenovo system. In the unlikely event of a drive failure, you retain possession of your drive while Lenovo replaces the failed drive part. Your data stays safely on your premises, in your hands. The YourDrive YourData service can be purchased in convenient bundles with Foundation, Essential, or Advanced Service upgrades and extensions. Lenovo Enterprise Server Software Support can help you troubleshoot your entire server software stack. Choose support for server operating systems from Microsoft, Red Hat, SUSE, and VMware; Microsoft server applications; or operating systems and applications. Support staff can help answer troubleshooting and diagnostic questions, address product compatibility and interoperability issues, isolate causes of problems, report defects to software vendors, and more. The following table lists the Ethernet LAN switches that are offered by Lenovo that can be used with the ThinkAgile HX Certified Nodes. The following table lists the rack cabinets that are offered by Lenovo that can be used with the ThinkAgile HX Certified Nodes. The following table lists the power distribution units (PDUs) that are offered by Lenovo that can be used with the ThinkAgile HX Certified Nodes. The following table list the uninterruptible power supply (UPS) units that are currently offered by Lenovo that can be used with the ThinkAgile HX Certified Nodes. Lenovo Financial Services reinforces Lenovo’s commitment to deliver pioneering products and services that are recognized for their quality, excellence, and trustworthiness. Lenovo Financial Services offers financing solutions and services that complement your technology solution anywhere in the world. We are dedicated to delivering a positive finance experience for customers like you who want to maximize your purchase power by obtaining the technology you need today, protect against technology obsolescence, and preserve your capital for other uses. We work with businesses, non-profit organizations, governments and educational institutions to finance their entire technology solution. We focus on making it easy to do business with us. Our highly experienced team of finance professionals operates in a work culture that emphasizes the importance of providing outstanding customer service. Our systems, processes and flexible policies support our goal of providing customers with a positive experience. We finance your entire solution. Unlike others, we allow you to bundle everything you need from hardware and software to service contracts, installation costs, training fees, and sales tax. If you decide weeks or months later to add to your solution, we can consolidate everything into a single invoice. Our Premier Client services provide large accounts with special handling services to ensure these complex transactions are serviced properly. As a premier client, you have a dedicated finance specialist who manages your account through its life, from first invoice through asset return or purchase. This specialist develops an in-depth understanding of your invoice and payment requirements. For you, this dedication provides a high-quality, easy, and positive financing experience. Lenovo and the Lenovo logo are trademarks or registered trademarks of Lenovo in the United States, other countries, or both. A current list of Lenovo trademarks is available on the Web at https://www.lenovo.com/us/en/legal/copytrade/. Intel® and Xeon® are trademarks or registered trademarks of Intel Corporation or its subsidiaries in the United States and other countries. Microsoft®, PowerShell, Windows PowerShell®, and Windows® are trademarks of Microsoft Corporation in the United States, other countries, or both. Other company, product, or service names may be trademarks or service marks of others.